No crystal ball here, just a few quick notes on potential insect problem to be aware of. Japanese Beetles: We haven’t seen peak Japanese Beetle emergence yet but that doesn’t mean it is too early to start looking. The warmer than usual winter may be beneficial to survival. In soybean, look for adults and/or their defoliation around field edges. In corn, monitor for silk clipping during pollination. Japanese Beetles tend to feed in aggregations so finding damage can be difficult. Soybean Aphid: Very few reports so far, however, people are finding them. Mostly low numbers with a low percentage of plants infested/field. But it still is a good time to be spot-checking fields. European corn borer: I expect damage to be very light this year. However, for the occasional field, the best treatment period for first generation will soon be coming to an end in northern Wisconsin. If you do find a field with a significant damage, make sure the larvae are still feeding in the whorl before treating. Potato leafhopper: The next few weeks will be critical for population buildup and damage to alfalfa. New seedings should be checked. Sweep established stands as well but don’t over commit unless you are finding levels above threshold. 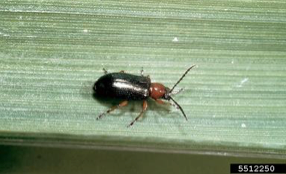 Rootworm beetles: We will start to see emergence of adults soon. Populations have been relatively low over the last two years but do keep an eye out for any early (or late) pollinating corn for silk clipping. Lodging from larval feeding may be observed if we get high winds/rains on the most advanced fields in the near future. Remember to investigate lodged field for signs of larvaal feeding. Don’t assume all lodging is from rootworm feeding. We are still over a month away from significant egg laying. Western bean cutworm: Damage was low in 2015. The most advanced fields within an area are likely candidates for oviposition.